The Federal reserve raised interest rates to between 2 – 2.25% and is expected to raise them again when they meet in December. Although, Fed President Bullard thinks the Fed shouldn’t raise rates right now. 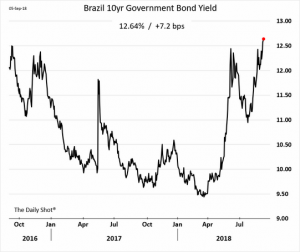 Meanwhile, Turkey rises interest rates to 24% in a dramatic bid to control rocketing inflation and prevent a currency crisis. After more than a year of intense negotiations, the United States, Canada and Mexico reached an agreement to update the North American Free Trade Agreement, the 1994 pact that governs more than $1.2 trillion worth of trade among the three nations. The new deal won’t go into effect right away. Most of the key provisions don’t start until 2020 because leaders from the three countries have to sign it and then Congress and the legislatures in Canada and Mexico have to approve it, a process that is expected to take months. after tweeting recently that he secured funding to take Tesla private, Elon Musk was sued by the SEC and subsequently settled a short period thereafter. A few days later, he was mocking the SEC and railed against short selling claiming it should be illegal. Not sure what’s going on with Elon, but sure does make you question his behavior. The Ambien defense only works for so long. Bytedance Ltd., a news aggregation app powered by artificial intelligence, is on its way to a more than $75 billion valuation — a price tag that surpasses Uber Technologies Inc. to top the world, according to CB Insights. General Electric replaces CEO Flannery after only 14 months on the job. When a $100 billion company in crisis fires a CEO who’s been on the job for just over a year, investors are sure to have lots of questions. General Electric Co. isn’t giving many answers though. The industrial giant dropped a shocking press release announcing that Chief Executive Officer John Flannery was being replaced by board member Larry Culp. And oh, profit this year will miss forecasts. After that, nothing. No press conference or briefing to give the new boss a chance to lay out his vision to analysts. No television interviews. 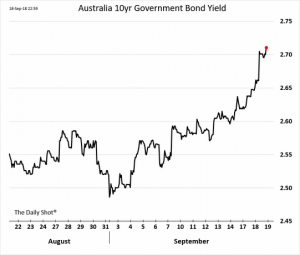 10 US treasury bond yields increase during the month from approx. 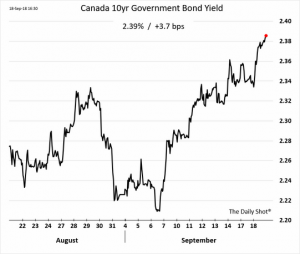 2.85% to 3.07%. 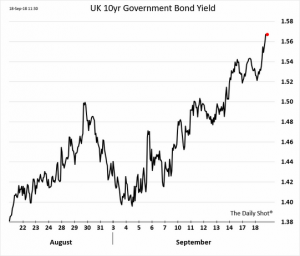 Since October started though, yields hit a high of 3.25% which is the highest level in 7 years. The only thing I know is that their predictions are not going to be correct. This is arguably one of the most difficult things to predict so take these predictions (and anyones like it) with a grain of salt. Recently, Howard Marks (cofounder at Oaktree Capital), was a guest on a Tim Ferriss podcast and discussed a wide range of topics. Oaktree Capital Management is a leading global alternative investment management firm with expertise in credit strategies which manages over $120 Billion. While Oaktree specializes in in debt/credit, they completely missed subprime and what was happening in that corner of the market. As you listen, he does state that they knew things weren’t making sense though and that it was not a time for risk taking. This is what makes them a great manager. I am reading a lot of predictions about when the next recession will occur and what will cause it (see list below). The take away from all of this is it’s almost impossible to predict what will cause the next recession and downturn and when. What I do know is we are late in the business cycle and in what most (including myself) believe to be a low return environment where you don’t want to take more risk than “makes sense”. As I preach often, risk management is key at this stage. Have a process and stick to it! 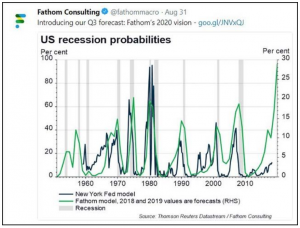 Another recession prediction by Fathom Consulting which shows the likelihood of a recession is growing. 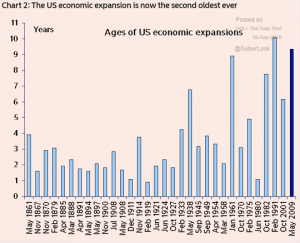 The recession predictions shouldn’t come at a huge surprise since we’re approaching the longest expansion on record. Inflation is running away in Argentina and no surprise the currency has been falling this year. Inflation hit over 30% last month. 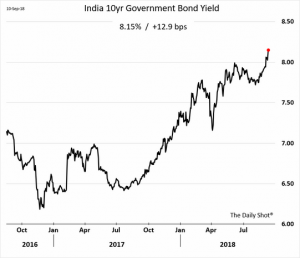 As emerging market currencies continue to fall, so do their bonds yields. 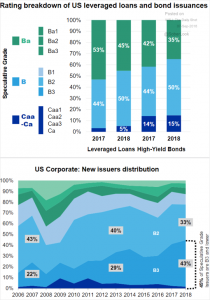 Bond quality is deteriorating in the US bond and leveraged loan market. Possible canary in the coal mine and not to be ignored. 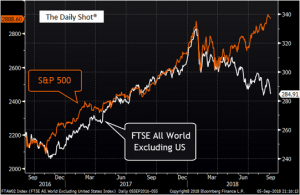 The S&P 500 and international stocks are diverging as the prospects in the US are shining brighter. 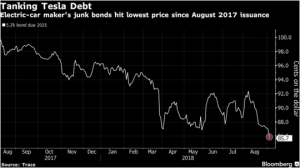 No surprise that Teslas bonds have been selling off since the SEC investigation was announced and Musks erradic tweets. A gauge of bullish and bearish momentum in the U.S. stock market is ringing alarms for strategists at Goldman Sachs. 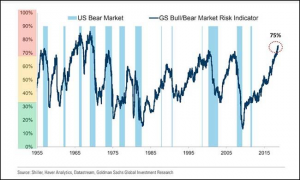 The investment bank’s so-called bull-bear indicator, which examines five market factors, indicates that the likelihood of a bear market occurring is at its highest point since around the mid-1970s (see chart below). Goldman analysts led by Peter Oppenheimer, chief global equities strategist, said an unusual period for Wall Street, characterized by loose monetary policy and a recent spate of fiscal stimulus has resulted in an uncannily bullish cycle for markets that is likely to come to a screeching halt. 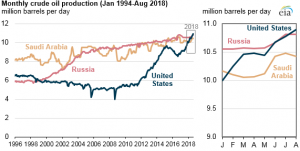 The US is now the largest producer of oil on a monthly basis just narrowly surpassing Russia. 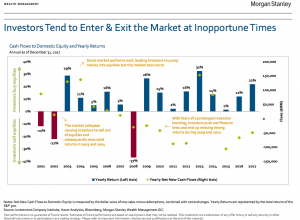 Research by Morgan Stanley shows how investors tend to enter and exit markets at the wrong times. If you listen to the Howard Marks podcast, he discusses how hard it is to buy when everyone around you is selling. 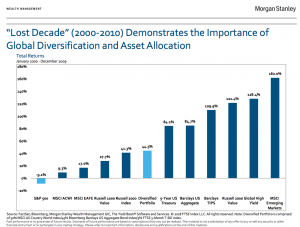 Another great chart by Morgan Stanley shows how important diversification can be. 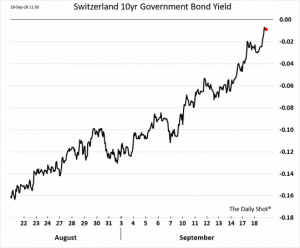 Bond yields across the globe are rising. 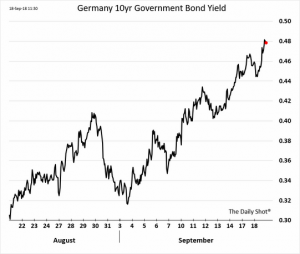 As global QE has ended in most countries and rates are rising, yields are following suit. 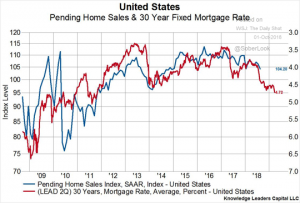 As yields and mortgage rates rise, home sales have declined and are expected to decline further.